Hezekiah spread the letter before the Lord (2 Kings 19:14). Woodcut by Rudolf Sch�fer (1929) in illustrated German Bible. Larger image. 14And Hezekiah received the letter of the hand of the messengers, and read it: and Hezekiah went up into the house of the LORD, and spread it before the LORD. 15And Hezekiah prayed to the LORD: "O LORD, God of Israel, enthroned between the cherubim, you alone are God over all the kingdoms of the earth. You have made heaven and earth. 16Give ear, O Lord, and hear; open your eyes, O LORD, and see; listen to the words Sennacherib has sent to insult the living God. 17"It is true, O LORD, that the Assyrian kings have laid waste these nations and their lands. 18They have thrown their gods into the fire and destroyed them, for they were not gods but only wood and stone, fashioned by men's hands. 19Now, O LORD our God, deliver us from his hand, so that all kingdoms on earth may know that you alone, O LORD, are God." 1In those days Hezekiah became ill and was at the point of death. The prophet Isaiah son of Amoz went to him and said, "This is what the Lord says: Put your house in order, because you are going to die; you will not recover." 2Hezekiah turned his face to the wall and prayed to the LORD, 3"Remember, O LORD, how I have walked before you faithfully and with wholehearted devotion and have done what is good in your eyes." And Hezekiah wept bitterly. 4Before Isaiah had left the middle court, the word of the LORD came to him: 5"Go back and tell Hezekiah, the leader of my people, 'This is what the LORD, the God of your father David, says: I have heard your prayer and seen your tears; I will heal you. On the third day from now you will go up to the temple of the LORD. 6I will add fifteen years to your life. And I will deliver you and this city from the hand of the king of Assyria. I will defend this city for my sake and for the sake of my servant David.' "
7Then Isaiah said, "Prepare a poultice of figs." They did so and applied it to the boil, and he recovered. Imagine the scene. The Assyrian army, the most powerful military force on earth, is ravaging the countryside a few miles away, threatening weaker cities into submission and destroying the rest, carting away their riches and levying a burdensome annual tax that bleeds the nation even more. Hundreds of thousands of enemy soldiers are within a two or three days march. You are Hezekiah, king of Judah, caught in the middle. Your capital is the fortress city of Jerusalem, high on the mountain chain that bisects Palestine. Stress is your daily companion. One report follows another of a city breached and burned, another cowed into submission. None is able to stand before the Assyrian army. Your people quail in fear, many calling for you to submit to Assyrians. "Resistance is hopeless," they cry. "You'll get us all killed." Yet you are a believer in Yahweh, the true God. "He will save us," you tell your people. Times couldn't be more desperate, more bleak, more filled with violence. How do you pray in a time like this? What do you say to God? Judah was a relatively small country caught between the nutcracker of Assyria (present-day Iraq) and the Egyptians, who encouraged rebellion against Assyria. While the dating and order of events of this time period are confusing,1here is the gist of what is going on. The Assyrians controlled the countries to the north and west of Judah. Previous Assyrian kings had attacked the Northern Kingdom of Samaria -- Tiglath Pileser III (745-727 BC), Shalmanezer V (727-722), and Sargon II (722-705). Samaria finally fell in 722 BC and the Northern Kingdom ceased to exist (2 Kings 17:3-6; 18:9-12). The Assyrian kings also conquered Philistine cities west of Judah and imposed a tribute upon Hezekiah's father. Calling a national Passover (2 Chronicles 29:5-11). Reopening the temple, which had been closed by his father, repairing it, and reorganizing its services, priests, and Levites (2 Chronicles 31:11-21). Opposing idol worship (2 Chronicles 30:14), toppling the hilltop "high places" where Baal was worshipped, smashing sacred stones, cutting down Asherah poles, and destroying Moses' bronze snake that had become an object of worship (2 Kings 18:4). 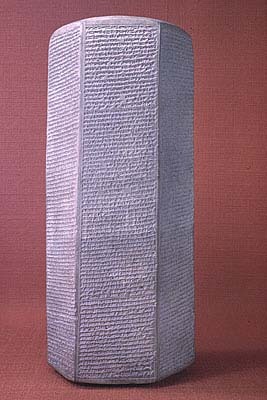 When Sargon II conquered the Philistine city of Ashdod in 711, Hezekiah avoided war. But when Assyrian troops departed, Hezekiah began to assert independence. "He rebelled against the king of Assyria and did not serve him" (1 Kings 18:7). He stopped paying tribute and expanded Judah's influence by attacking Philistine cities as far as Gaza that were allies of Assyria (18:8). Hezekiah was one of the chief ringleaders in a rebellion against Assyria. Tunneling a shaft through 1,748 feet of solid rock to supply water to the city in time of siege (2 Kings 20:20). Stopping up springs around Jerusalem that could supply water to an attacking Assyrian army (2 Chronicles 32:1-4). Extending and strengthening the wall of Jerusalem (2 Chronicles 32:5a). Increasing the production of shields and weapons (2 Chronicles 32:5b). Records of Sennacherib's military campaigns are incised on this 6-sided baked clay prism in tiny cuneiform script. In the Museum of the Oriental Institute, University of Chicago. Larger image. "So Hezekiah king of Judah sent this message to the king of Assyria at Lachish: 'I have done wrong. Withdraw from me, and I will pay whatever you demand of me.' The king of Assyria exacted from Hezekiah king of Judah three hundred talents of silver and thirty talents of gold. So Hezekiah gave him all the silver that was found in the temple of the LORD and in the treasuries of the royal palace. At this time Hezekiah king of Judah stripped off the gold with which he had covered the doors and doorposts of the temple of the LORD, and gave it to the king of Assyria." (2 Kings 18:14-15). The prophet Isaiah reassured Hezekiah, and the Assyrian army withdrew to fight the Egyptians (2 Kings 19:9). Then a letter came to Hezekiah demanding that he surrender Jerusalem. We'll pause now and consider Hezekiah's prayer in verses 14-19. 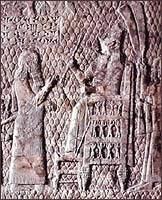 Detail of Sennacherib on his throne about 701 BC. 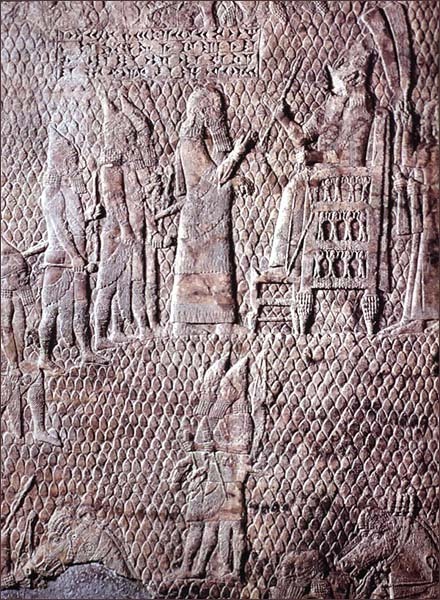 From wall relief, "Capitulation of Lachish in Palestine," Southwest Palace of Sennacherib, Nineveh. Larger image. When Hezekiah receives the letter, he brings it before the Lord and spreads it out for God to read. He reads it to God and observes that the insult is to the living God far more than it is to Hezekiah himself. This is God's insult and demand's God's response. Think of the pressure we take upon ourselves when we try to be the general in God's battles. We get discouraged. We give up. We fold our tents and go home. We can't handle it. But when we actually believe that the battle is the Lord's to fight, then we let him be the general and just follow his orders. Yes, we're under the stress of battle, but not the stress of trying to play God. Q1. (19:14) What is the significance of Hezekiah spreading out the enemy's message before the Lord? What is the underlying principle illustrated here? How can we apply this principle to our own lives? What happens when we don't apply this principle? Hezekiah brings the letter before the Lord and begins his prayer. This corresponds to the magnificent opening of the Lord's Prayer, "Our Father, who art in heaven, hallowed be thy name." Hezekiah begins his prayer with an awesome vision of who God really is. "LORD" is the Hebrew personal, specific name of God, pronounced "YAW-whey." The Jews felt that the name of the Lord was too holy to even pronounce, and substituted for it when reading or speaking the word Adonai, "lord." In most English Bibles when you see LORD in small caps it indicates Yahweh. Hezekiah calls his God by name. "God of Israel." Israel is the name God gave to Jacob (Genesis 32:28) and is applied to the nation. In the period of the divided kingdom, Israel was generally used to designate the Northern Kingdom as opposed to Judah, the Southern Kingdom. It is significant that Hezekiah uses this term, shortly after the fall of the Northern Kingdom, to refer to the remaining remnant of God's people. "Enthroned between the cherubim." "Enthroned" (NIV, NRSV) and "dwellest" (KJV) is the common verb yāshab, "sit, remain, dwell." Cherubim is the plural of kerûb, "angelic beings who are represented as part human, part animal. "3The reference here is to the pair of cherubs facing each other whose wings overshadow the cover of the ark of the covenant (Exodus 25:20). The ark of the covenant typified the throne of God in the Holy of Holies -- the cover or "mercy seat" as his dwelling place and the cherubim serving as guardians on each side. (For more on this, see my comments and illustrations in "Near Eastern Thrones and the Ark of the Covenant", www.jesuswalk.com/kingdom/thrones.htm). 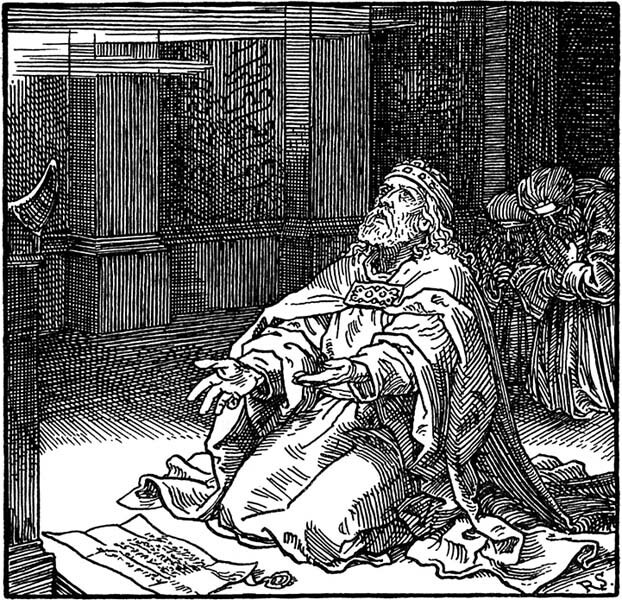 Hezekiah prays to Yahweh whom he sees as enthroned between the cherubim, in a much higher place than any earthly king. His vision of God drives his own faith in Yahweh's power. "You alone are God over all the kingdoms of the earth." Hezekiah is a monotheist, a believer in one God. And he asserts that God's reign extends over and encompasses every human kingdom on earth, including the Assyrian empire. "You have made heaven and earth." Hezekiah sees no limitation to God's power, since he made heaven and earth and can control anything within them. In 1952, J.B. Phillips wrote Your God Is Too Small (Touchstone, reprint 1997, ISBN 0684846969). The title says it all. If our own vision of God is small, we'll never ask of him great things. Hezekiah's prayer springs from his faith in the God of creation. "O LORD, God of Israel, enthroned between the cherubim, you alone are God over all the kingdoms of the earth. You have made heaven and earth. 16Give ear, O Lord, and hear; open your eyes, O LORD, and see; listen to the words Sennacherib has sent to insult the living God. The actual petition is quite brief: "Deliver us from his hand!" The basis of Hezekiah's appeal is that God be seen by the nations as the only true God. Q2. (19:15) How do the first two sentences of Hezekiah's prayer (verse 15) correspond to the first sentence of the Lord's Prayer? How are they important to faith? How are they important to God answering the prayer? "That night the angel of the LORD went out and put to death a hundred and eighty-five thousand men in the Assyrian camp. When the people got up the next morning -- there were all the dead bodies! So Sennacherib king of Assyria broke camp and withdrew. He returned to Nineveh and stayed there. God answered Hezekiah's prayer, but then another crisis loomed. The timing of the illness, "in those days," can't be determined exactly,4but it may well have taken place around 701 BC at the time of Sennacharib's campaign. From God's response to Hezekiah's prayer through the Prophet Isaiah (20:6b), it sounds like Sennacharib's presence was still threatening Jerusalem at this time. What a time to fall ill and die! What a difficult time this would have been to leave his country leaderless! Hezekiah mortal illness involved a boil (20:7), Hebrew shehîn, "boil, enflamed spot. "5This may have been a furuncle or carbuncle, the latter being "a more extensive inflammation of the skin, usually attended by a lowering of bodily resistance, and it can prove fatal. "6To us, most infections are easily cured with antibiotics, but in those days, a serious infection could bring death. You may think it cruel to tell Hezekiah to "Put your house in order," but it was really a kindness. It is likely that he had no clear successor at that point. If this took place in 701, it was before his son Manasseh was born. Hezekiah needed to name a successor so leadership would pass to another at his death without palace intrigues and unnecessary disruption to the kingdom. But Hezekiah did respond in prayer and faith, and God changed his mind. Let's examine Hezekiah's short prayer. The common English translations of the adjective describing Hezekiah's weeping do us a disservice. "Bitterly" (NIV, NRSV) and "sore" (KJV) suggest a wrong attitude on Hezekiah's part where the text doesn't imply any. The adjective is gādōl, "great," indicating "many" in number and other intensified concepts like "loudness" in sound, being old in years," etc.8A good translation in this context is "profusely." Hezekiah wept a lot; he wept profusely. What kind of a baby is Hezekiah? Isn't it interesting how we westerners tend to see tears as a sign of weakness in a man? "Real men don't cry," is the way we train our sons. It's part of the macho exterior that men try to project. But in Hezekiah's culture, men were able to admit and express their emotions openly. It was no shame to cry when under stress. Was Hezekiah terrified of death? Was he a faithless whiner? Certainly he did not look forward to death with the same longing as Paul, who saw it as "far better" (Philippians 1:23). But it is unfair to judge him by our knowledge this side of the cross. Hezekiah didn't know about eternal life in the presence of God; it was a later revelation. His tears probably represent more than a fear of death. As mentioned above, it is likely that he had no heir yet, no one to carry on the line of Davidic kings promised centuries before that would culminate in a Messiah (2 Samuel 7:11-16). Hezekiah was a godly man who hoped in God. Young suggests: "Hezekiah could well be facing the same temptation that came to Abraham when he was commanded to offer up his son (Genesis 22:1)"9-- that is, the conflict of God's promise concerning his offspring with God's command that seemed to conflict with the promise. What does it mean, "Hezekiah turned his face to the wall and prayed to the Lord...."? Is this a childish, petulant response to an unwelcome word from God's prophet? I don't think so. He is in his own bedroom, probably hovered over by various counselors, officers, and physicians who are concerned at the impending death of this strong and godly king. To be alone with God that he might pray with some privacy and without interruption, he turns to the wall. God has been his help in crisis many times. He turns to God now in earnest and heartfelt prayer. His tears are tears of emotion and struggle. You've been there. You know. Hezekiah is a human, weakened by illness, facing the heavy responsibilities of defending his nation against its enemies. In addition, now he faces death and the burden of succession. "Prayed" is pālal, "intervene, interpose, pray," the most common Hebrew root for prayer and praying, the verb occurring 84 times in the Old Testament. Though the exact derivation of the root is a matter of conjecture, both the verb and the noun (tepillâ, 20:5) refer most often to intercessory prayer.10Here he petitions God strongly for his own life, but because of his position and responsibility, he also prays for his nation's uncertain future -- under military pressure, leaderless, and without a successor that can inspire national unity and resistance. "When he does wrong, I will punish him with the rod of men, with floggings inflicted by men. But my love will never be taken away from him, as I took it away from Saul, whom I removed from before you. Your house and your kingdom will endure forever before me; your throne will be established forever" (2 Samuel 7:14-16). Hezekiah, I am sure, had not reached sinless perfection, but he had been careful (unlike his father) to live a godly, righteous, and faithful life before the Lord. He had been zealous for the Lord, in the face of much pressure and criticism from idolaters. He had encouraged the people with confidence and trust in God when threatened by his enemies. Hezekiah not only talked about a righteous life. He lived it! He walked the walk! Q3. Why is Hezekiah's healing important for his nation? How did it relate to God's promises to David? Wow! God's answer is both amazing and wonderful. A saint of God prays and immediately God both changes his mind and sends alternate instructions to his prophet. A few minutes after Hezekiah prays, Isaiah returns to his bedroom. Hezekiah is still lying on his side facing the wall. Isaiah says: "Hezekiah, this is what the LORD, the God of your father David, says...." Hezekiah turns over with wonder and joy on his face. According to Pliny, figs were used for the cure of ulcers.11Did the poultice of figs cure Hezekiah? It was probably instrumental, but only because God enabled it. Prior to this, Hezekiah was about to die and no figs would have helped. It is God who turned the situation around! Within three days Hezekiah would be strong enough to get out of bed and to go up to the temple (verse 6d). I've heard people accuse Hezekiah of selfishness in his prayer for healing. The result of his prayer, this argument contends, is the birth of Manasseh, the worst king Judah had ever seen. If Hezekiah hadn't asked for healing, Manasseh would never have been born. Be careful what you pray for! This argument is specious and weak. Judah had a long history of bad kings before and after Hezekiah. Hezekiah isn't responsible for Manesseh's sins any more than God is. Without Manasseh, we wouldn't have had Josiah the boy king who brought about great reforms. Beyond seeking to pray within the boundaries of what we know to be God's will, the dictum of "Be careful what you pray for," is useless. No one can see the future but God. No one could have predicted Manasseh's wickedness except God himself. We pray to a Father who gives us what is good for us, not what is bad for us (Matthew 7:7-11). We can trust our prayers to a loving Father, who knows better that we do. God chose to answer Hezekiah's prayer and to bless him during his lifetime. Let's not confuse this by second-guessing. Why Did God Grant Hezekiah's Prayer? Hezekiah prayed. If he hadn't asked, God would have continued with the plan announced by Isaiah -- an early death. James says, "You do not have, because you do not ask God...." (James 4:2b). Promises made to David centuries before. The Lord identifies himself as "the God of your father David..." (verse 5b) and says he will defend the city "for the sake of my servant David" (verse 6b). Respect for Hezekiah's leadership role. "Hezekiah, the leader of my people" (verse 5a). Concern for Jerusalem's welfare. I will deliver you and this city from the hand of the king of Assyria. I will defend this city...." (verse 6). Honor for Hezekiah's upright life. "I have heard your prayer," indicates that he has heard Hezekiah's implied prayer and honored the basis on which he made it, an upright life. Love for Hezekiah. "I have heard your prayer and seen your tears" (verse 5c). Hezekiah loves God and God loves Hezekiah. The Father has seen his child's tears and responded. You, dear friend, are also loved by God. He has redeemed you by the blood of Jesus, which cannot be valued because it is so costly. He has made promises to you. He has encouraged you to pray to him. You may not be a king, but you have influence important to the kingdom. I encourage you to pray. I also encourage you to consider personal holiness. Sometimes God answers the prayers of rank sinners and backslidden Christians. But his ear is particularly open to his children who seek to be obedient to him. Consider your own children's petitions. When your child is being openly rebellious, are you quick to respond to his demands? No, you withhold everything except the necessities so your actions aren't construed as rewarding disobedience. But when your child is compliant and obedient -- and asks for something special -- you think twice about saying no. You want to say yes. And if it won't hurt him, you'll often give it to him. This doesn't mean you must be sinless to get your prayers answered. Hezekiah wasn't sinless (2 Chronicles 32:26). He had made mistakes, wrong decisions, and had moments that reflect a weakness of faith. But Hezekiah made an honest attempt to follow God in his life and repented when he was convicted of his sin. God honored this with blessing, success, and answered prayer. In no way do I want to imply that God owes us anything, that salvation is by works rather than grace. This isn't a works-righteousness mentality. It's just good heavenly parenting. All God's gifts are by grace -- his own favor towards us, which is neither earned nor deserved. But God does honor the prayers of the upright over those of the backslidden. James teaches us: "The prayer of a righteous man is powerful and effective" (James 5:16b). Q4. (20:3) What is the basis on which Hezekiah asks for healing? Why is personal righteousness and holiness important in getting your prayers answered? How can unrighteousness prevent answered prayer if all gifts from God are by grace anyway? What do I learn from Hezekiah's example of a prayer that God will answer? God's heart is open to the prayer of his child seeking to live a faithful, upright, righteous life. Since God has less need for discipline, he has greater freedom to grant us answers to our prayers without hurting us. Can you pray Hezekiah's simple prayer? "Remember, O LORD, how I have walked before you faithfully and with wholehearted devotion and have done what is good in your eyes." I hope so. Father, help us to move from being unruly children to the place where you don't need to discipline us so much. Help us to be like your servant Hezekiah, who trusted in you and your promises with all his heart, and wasn't afraid to ask you for what he needed. Help us grow. In Jesus' name, we pray. Amen. E.J. Young discusses the various problems of dating and reconciling accounts in a long and detailed appendix (Edward J. Young, The Book of Isaiah (Eerdmans, 1969), Vol. 2, Appendix 1, pp. 540-555). The period is also discussed in Donald J. Wiseman, 1 & 2 Kings: An Introduction and Commentary (Tyndale Old Testament Commentaries; InterVarsity Press, 1993), pp. 271-285; and Samuel J. Schultz, "Hezekiah," ISBE 2:703-705. Quoted from the Prism of Sennacherib, in James B. Pritchard (ed. ), The Ancient Near East: An Anthology of Texts and Pictures (Princeton University Press/Oxford University Press, 1958), "Sennacherib (704-681 BC): The Siege of Jerusalem," pp. 199-201 (corresponds to ANET 287-288). R. Laird Harris, kerûb, TWOT #1036. Elmer A. Martens, shhn, TWOT #2364a. Alexander Macalister and Roland K. Harrison, "Boil," ISBE 1:532. Translated and cited by Young, Isaiah 2:509, fn. 3, from Campegius Vitringa, Commentarius in librum propheticum Jesaie (Leeuwarden, 1714-1720), commenting on Isaiah 38. Elmer B. Smick, gādal, TWOT #315d. Victor P. Hamilton, pālal, TWOT #1776.